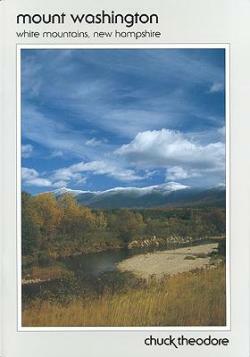 Mount Washington, by Chuck Theodore, 1998. Souvenir booklet features a compilation of 43 Theodore photos focused on Mount Washington and the Presidential Range. Alpine landscapes, AMC huts, the Cog Railway, Lakes of the Clouds, Mount Washington Hotel and winter scenes are all featured. 32 pp, 7”x 10”.